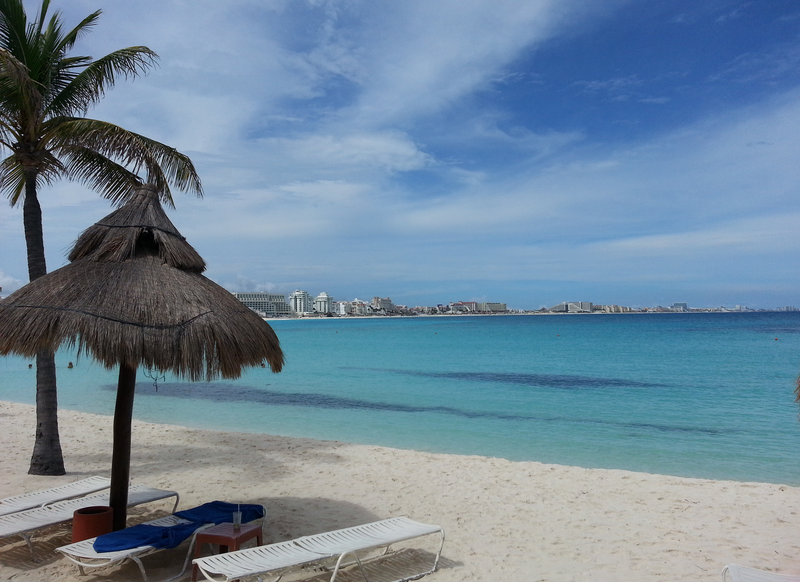 Calm & shallow beach at Club Med Cancun, south of Zona Hotelera. The 5-trident wing, Jade, has its own pool and beach access. 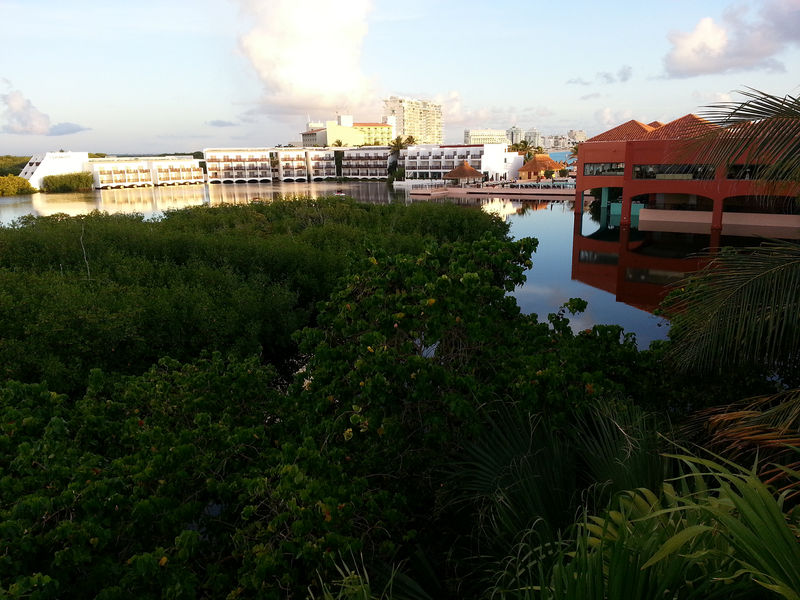 Mangrove surrounding the resort keeps the beach & lagoon pristine. 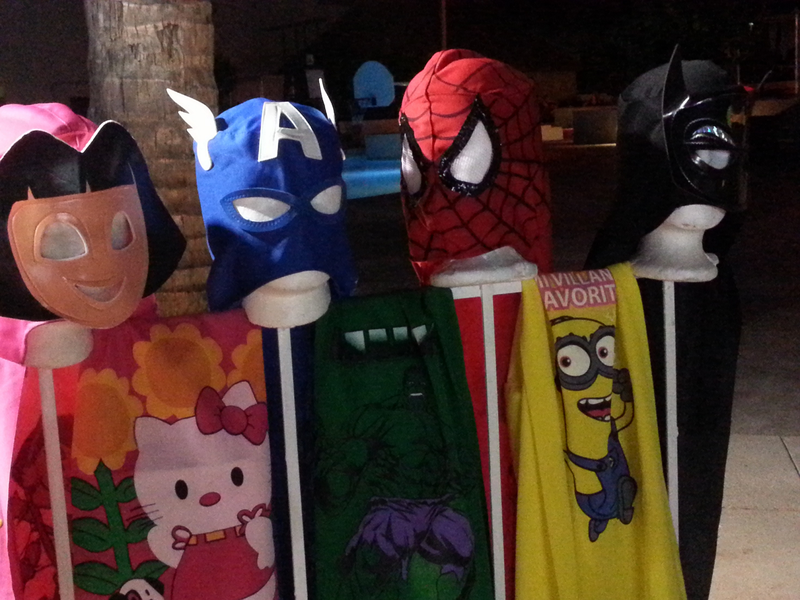 Night Markets showcase Mexican folk arts, great souvenirs for all ages. I didn’t think the words remote and Cancun would ever be in the same sentence, but the Club Med Cancun Yucatan is a convenient, all-inclusive resort that is so peacefully isolated and eco-friendly, that guests feel far, far away. For one of Cancun’s first resorts in 1976, Club Med wisely chose 22 acres of beach, reef and mangrove on the Nizuc Peninsula to create a signature village. An adults-only resort for decades, it was remodeled to accommodate families and opened the deluxe Jade wing in 2009. After this recent $14.4 million renovation and expansion, the 436-room resort is one of the brand’s tops for families, a favorite on TripAdvisor, and FamilyVacationCritic.com’s pick for a Mexico Top 10 Resort. If you’ve never been swept up in a Club Med experience, it may be tough to understand how the gracious G.O.s (their staff), roster of activities and classes, delicious food, and joie de vivre make for a special vacation. The Cancun Village, for example, operates on Club Med Time: they ignore Daylights Savings Time in order to have more hours of sun for their guests. It’s all-inclusive of course, so you don’t have to worry about what anyone’s spending on food and booze. There are three indoor – outdoor bars, with plenty of mom Margaritas and Coronas, but the emphasis is more on fun than on getting smashed. There’s live nightly entertainment and, at midnight, a signature line dance that guests are encouraged to join, as the Club Med theme song is played at resorts around the world. The Cancun resort offers all of these moments. It has wonderful kids programs for ages 4-17 included in the rates, and just added a Petit Club for ages 2-3 for an extra fee. Best for guests, putting it at #1 on our own list of Top 10 Cancun Family Resorts, is its position on the Meso-American Barrier Reef where the Caribbean meets the Gulf of Mexico, giving it one of the region’s best beaches and most gentle, toddler-welcoming surf. Renovated rooms in the original Cancun Yucatan wings have been decorated in a retro sort of way that makes them feel authentically Mexican. Unlike the comparatively posh Sandpiper Bay in Port St. Lucie, Florida, the Cancun village has simple rooms with tile floors, stucco walls painted in blasts of tropical colors accented by hammered copper X’s, rattan furnishings and louvered closet doors that harken back to traditional Mexican resorts. Carved wooden beds, work spaces and fixtures are made in Mexico and decorated with details of color, wrought iron and rattan that evoke the country’s tropical, relaxed style, as you can see in this video. Ocean or garden view rooms come with king beds and single pullout sofas, or two queen beds, and can accommodate a family of four with a crib in plenty of space. My complaint was with an air-conditioning system that blasted frozen air or none (which caused the walls to perspire from condensation), and a phone that would take itself off the hook and announce a busy signal loudly in the middle of the night. I chalk these mishaps up to Mexico’s charming eccentricities and, at the right price, the older rooms are very nice. Priced higher but considerably more deluxe in style, are the 60 newly built suites in the Agua Marina Wing. This aquamarine-tinted wing of the resort is next to a pretty new indoor/outdoor restaurant and has its own small beach and playground. Very large suites have two bedrooms (king bed and two twins) sleeping six; the oceanview ones have two baths as well, and the less expensive gardenview suites have two bedrooms with one bath. Motion sensors control the air-conditioning and power use, and a privacy curtain at the foot of the king bed makes the pullout sofa almost another room for toddlers and babies. We love the outdoor shower on the large deck, the family-welcoming seating area in front of the sliding doors, and the ease of stepping out of ground floor rooms to a second seating area overlooking the water. Going up in price brings us to the very chic Jade wing, the area of the resort you would expect to see reality TV stars and investment bankers. The “get” here is privacy, plenty of it. There’s a separate reception and concierge, a separate lounge with snacks, beverages and treats and an elegant infinity pool. The Jade oceanview room we saw had a romantic interior bathing area lit by candles, inspiring romance. Only a few of these rooms connect to two-bedroom family units but the single rooms are ideal for new parents who want to cuddle while baby naps. Healthy dining, well prepared, is a Club Med signature. Buffets are fresh and plentiful, and some of the restaurants offer table service in the evening. The newest of three Cancun restaurants is Las Cazuelas buffet and bar in the Agua Marina wing, with very tasty Mexican and international food. Estancia is an oceanview Argentine grill by night, where diners can watch chefs prepare steaks, fish and poultry in a glassed-in kitchen or sit out on the deck. By day, it serves snacks, a late brunch, and has a delicious new flavor of empanada on the menu daily. Reservations at both are recommended for evening. Hacienda has more formal, indoor seating with a very small outdoor deck. It’s located above the main pool and serves three meals, buffet style, with a menu that changes daily. Although Club Med will give your child a Kids Menu, avoid it. Consider this a chance to introduce them to healthy new foods and break the chicken finger habit. Club Med has received our annual Getaways for Tiny Travelers Award for several years because they not only have infant and toddler programs, but they have excellent ones. In North America, parents looking for infant nurseries for under 2s will have to stick to Club Med villages in Ixtapa, Mexico and Sandpiper Bay, Florida for the Baby Clubs. 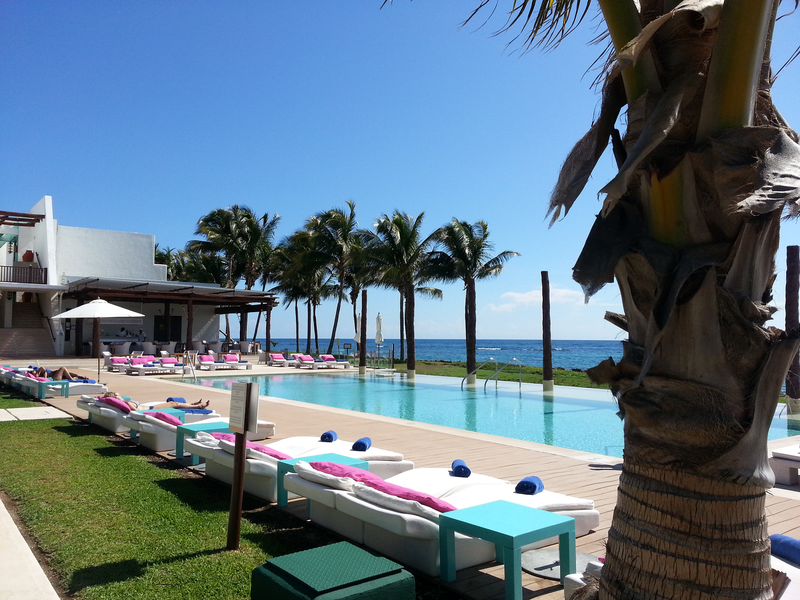 Cancun has a new Petit Club for ages 2-3 built to meet guest demand. Well trained counselors, spotless and cheerful facilities, and daylong programs (you can even enroll ages 2-11 in a Pyjama Club from 9pm to 1am, for a fee) really allow adults to have some guilt-free me time. Their staff can also arrange private in-room babysitting but the US$25/hour fee is hefty. Car Wash, a lounge with old VWs protruding from one wall, is similar to the tweens and teens’ PassWorld at other Club Med resorts. Think computer games, comfy seating, big screen TVs and a “no adults” policy. One great Club Med benefit for athletic types is the availability of sports that usually cost a fortune at other resorts. Water skiing, wind surfing, wakeboarding, kayaking, snorkeling, sailing, trapeze arts, tennis — even scuba lessons at the pool — are part of the deal here. (Golf, deep sea fishing, and scuba are off site and cost extra.) The well trained G.O.s work with willing guests regardless of their skill level, or even their physical ability, making it a great place for grandparents to introduce grandkids to a sport they love. When you want to play together, there are open courts for basketball, beach soccer, bocce and beach volleyball, and facilities for ping pong, foosball and water polo. If you don’t want to show off in front of the kids, go off on your own. At Club Med, we’ve found the counselors are so terrific that kids would rather be in the program with new friends than hanging out with parents. It’s silly to go all the way to Cancun and not experience the extraordinary Mayan culture in evidence at Tulum and Chichen-Itza, among many other Mayan sites. There are a few half and full-day sightseeing options every day, ranging from swimming with dolphins to shopping in Playa del Carmen, visiting the UNESCO World Heritage Site at Chichen-Itza, or going out in a power boat. We took the guided, half-day excursion to Tulum, followed by a fun waterborne tour of the Kantun Chi cenote (underground river) and a delicious taco lunch catered by Club Med G.O.s. A popular new addition is the Club Med Spa by Comfort Zone, a simple Zen-meets-rattan wing of treatment rooms upstairs with a restful seating area below. The surprise is how good the masseuses are; I heard the same about the therapists doing facials. The spa offers facials, massages and mani/pedis to teens as well, for an additional fee. When you’re ready to plan the ideal tropical, multigenerational beach vacation, contact a travel agent or visit their site at ClubMed.us. For the spring and winter school breaks, and Christmas holidays — the period when your stay can run $1,500/week per adult — you will have to reserve several month in advance. The good news is that connecting rooms are guaranteed as soon as you book. If your schedule is more flexible, you can take advantage of many seasonal specials on their site. For example, we found that booking an August 2015 week-long stay in November 2014 will cost $868/adult instead of $1,369/adult. Their agents also offer good airfare values if you’re not booking your own. In most seasons, children under 4 stay free, children 4 to 12 pay 50% of the adult rate, and tweens 12-15 pay 60% of it. So, the Club Med difference should be evident after 1,500 words. In closing, I suggest you reserve a massage on arrival so you can dive right in, and another one before departure… to work out any sore muscles from discovering the new you.